This is and was *Raffles. 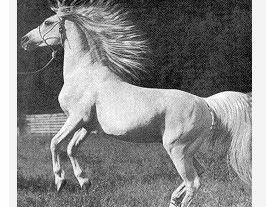 The “little white dynamo” Arabian stallion, one of the icons of the Arabian breed. Bred by Lady Wentworth of Crabbet Park Stud in England. *Raffles was not one of her favorite accomplishments, according to Lady Wentworth herself, at least at the time. *Raffles’ sire, Skowronek, had a tremendous effect on the Arabian breed. He was a champion himself, a sire of champions, and considered one of the leading male (sire) lines among the Arabian breed. *Raffles’ dam, *Rifala, was a producer of champions, a leading female (dam) line, and a champion mare herself, winning her classes in Great Britain and later when she was imported to the U.S. It was believed that *Raffles would never be a great sire, as he was found to be sterile, and too small to amount to anything. This according to Lady Wentworth, so she kept *Raffles away from the public, never once shown on the grounds of Crabbet Park at her horse events. Where her best Arabians were paraded before the public and potential buyers. As luck would have it though; on one of Roger Selby’s visits to Crabbet Park, Mr. Selby found *Raffles while walking through the stables. This was always forbidden by Lady Wentworth, but because of his venture *Raffles life would never be the same. 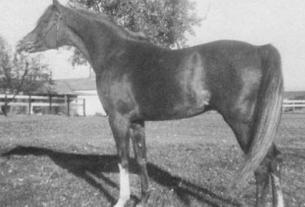 *Raffles was eventually imported to Selby’s Stud of Ohio in 1932. It was here, with the help of Jimmie and Thelma Dean, that *Raffles was allowed to just be a horse, and with time adjusted to his new surroundings. At the age of eleven *Raffles bred his first pony mares, and to their surprise they all settled, and the resulting foals all looked alike! *Raffles never once showed any signs of being sterile again. He went on to produce many champions, and became a leading sire of champions, and leading male (sire) line just like his sire, Skowronek. *Raffles himself was a champion in 1933; awarded the 3-Gaited Championship at the National Arabian Show in Nashville. Many champions today carry *Raffles blood in their pedigrees. The Tormohlens of Ben Hur Farms in Indiana, among many other breeders, soon recognized the potential of *Raffles as a sire. Thus the Tormohlens started sending their mares to *Raffles for breeding. The amazing thing about *Raffles’ offspring were their consistency, as the mares that were sent to *Raffles had varied in their quality. When the Tormohlens finally decided to disperse their beautiful herd of mostly *Raffles bred horses, it was James Lewis Jr., of Lewisfield Farms, that purchased the nucleus of their herd. Aaraf and Aarafa were among the horses Lewis purchased. They were both champions, and full brother and sister. James Lewis inbred these two, and produced the beautiful halter champion, Lewisfield Sun God. It is from this stallion, that “The *Raffles Connection” is found in the “Phara Farm” horses. It was Lewisfield Sun God that captured Annette Weber’s heart, and was the beginning of her fourty year, and counting, devotion to breeding the Lewisfield Sun God lines, producing the exquisite Phara Farm Arabians of Wallace, California. Annette has linebred, and inbred these horses, and the results have been amazing. Just as Alice Payne did with *Raffles. Producing a strong gene pool, and with unbelievable consistency. You can definitely see the *Raffles connection in the Phara bred horses, as they contain many crosses to Lewisfield Sun God, therefore containing a strong *Raffles line. Alice Payne was *Raffles last owner, when she purchased him at the age of 24, after recovering from a broken leg. Alice had *Raffles for three years until his natural passing on May 11, 1953 at the age of 27. The last three years of his life were very busy in the breeding shed. In fact Alice once said she’d breed *Raffles to *Raffles if she could. His gene pool was that strong! An interesting fact…Lady Wentworth continually tried to buy *Raffles back from Roger Selby, once she saw the influence he was having in the U.S. How ironic that *Raffles would actually turn out to be one of her greatest accomplishments!